Danny Cullenward, an economist with the climate-change think tank Near Zero and a member of the advisory committee, said the air board’s position is based on a math error. “The analytical integrity of what the staff has put forward does not meet the standard set by state law,” Cullenward said. [Air Resources Board Chair Mary] Nichols acknowledged Thursday that the issue “sticks in the craw” of those who continue to question whether the board has sufficiently addressed it. “It hasn’t been put to rest; let’s put it that way,” she said. BE IT FURTHER RESOLVED that the Board directs the Executive Officer to quantify and report back to the Board, by no later than December 31, 2021, the volume of unused allowances from 2013 through 2020, including volumes held in private accounts, and the potential for unused allowances to hinder the ability of the program to help achieve the SB 32 target. The Executive Officer shall hold a public workshop in 2019 to discuss potential methodologies to evaluate this topic. This is an important step forward, but it’s worth emphasizing that the evidence of a problem is crystal clear and part of the Board’s own record (see, for example, the nearly 500 pages of analysis Near Zero submitted into the formal 45-day comment period). Despite an extensive formal record, however, the Board refused to analyze the stringency of its post-2020 program caps or even acknowledge independent analysts’ concerns. So while I’m very glad that the Board has agreed to a process for revisiting its questionable analysis, the ARB staff’s willingness to consider facts and evidence will need to improve if this process is to deliver meaningful progress. The Carbon Market Supply Association warned CARB in September 2016 that oversupply was “as high as 300 million tons.” Warnings were echoed by the LAO (in February 2017 and again in December 2017), Chris Busch at the energy policy firm Energy Innovation in December 2017, the Environmental Commissioner of Ontario (in a January 2018 report contemplating that province’s own carbon pricing system), Near Zero in March 2018 (and many times since; see here for a synthesis), and the Independent Emissions Market Advisory Committee in October 2018. The entire story is well worth a read. Interpreting AB 398’s carbon offsets limits (Mar. 15, 2018). CAISO continues to refine its approach to greenhouse gas accounting in its regional Energy Imbalance Market. In a revised February 2018 proposal, CAISO announced its decision to move away from the pilot two-pass approach to calculating net GHG emissions after "secondary dispatch" (i.e., resource shuffling to serve California load) and suggested a new approach for attributing net GHG emissions in the regional electricity market. Although the challenges CAISO identified with the two-pass solution are serious and indicate the need for fresh thinking, CAISO's new proposal would put the costs of managing leakage only on out-of-state zero-carbon resources (wind, solar, and hydro). As I point out in a new comment letter, not only does this approach ignore the leakage risks from replacing high-carbon fossil resources with low-carbon fossil resources (i.e., replacing coal-fired electricity with power from natural gas), but the outcome would mean that the GHG costs attributable to zero-carbon resources will depend on whether those resources are located in California (in which case they face zero GHG costs) or outside of California (in which case they would face a positive GHG cost under the CAISO proposal). In my view, CAISO's proposal increases the risks of a dormant commerce clause challenge. This should cause some concern as the state government of Utah is actively contemplating litigation behalf of its coal power plants (E&E News subscription req'd). While CAISO's proposal to exempt fossil resources from carrying the costs of GHG leakage might avoid potential legal challenges from coal resources, it wouldn't protect California's climate policies from a challenge brought by zero-carbon resources (such as wind, solar, or hydro) that want to sell their power to CAISO territory on equal terms with in-state competitors. The good news is that CAISO has other options for incorporating California's climate policies in the EIM tariff design without increasing legal risks. For example, CAISO and the Air Resources Board could update and refine the situation in place today. Currently, ARB intends to retire a certain number of allowances based on a coarse estimate of the regional GHG leakage from "secondary dispatch" (as CAISO calls it, also known as resource shuffling in other discussions). These leakage estimates could be improved by CAISO's rigorous calculation of the net GHG emissions attributable to EIM deliveries to California territory. ARB could then account for leakage in the cap-and-trade program by retiring an equal number of allowances to compensate for the leakage CAISO observes. This approach would preserve the environmental integrity of California's carbon market without favoring in-state resources over comparable out-of-state facilities because retiring allowances places raises carbon prices equally for all entities subject to the cap-and-trade program, independent of the location of the power plant that exports electricity to serve California load. CAISO has been a leader on integrating state-level carbon pricing into regional electricity market design, successfully implementing the country's first FERC-approved tariff to include an explicit carbon price in the EIM. I hope CAISO will continue to demonstrate climate leadership by carefully evaluating the dormant commerce clause risks of any modifications to the current EIM tariff structure and incorporating these issues into their discussions with ARB. Ari Peskoe just released a workshop report from a recent meeting hosted by the Harvard Electricity Law Initiative called Regulatory Paths Forward for a Cleaner Grid. I was glad to join Ari and the other workshop participants to talk about California's approach to resource adequacy and some of the jurisdictional tensions that arise in regional energy markets. Julie Cart at CALmatters has a follow-up story on how the issue of extra free allocation to industry is playing out in the state legislature. Last week at a Senate Budget Subcommittee hearing on cap-and-trade program revenue spending, Senator Bob Wieckowski raised concerns about ARB's decision to increase free allocation to industry above and beyond what is required under AB 398. CALmatters reports that the Senator indicated he would consider putting language in a cap-and-trade appropriations bill that would reverse ARB's directive in Resolution 17-21 to increase free allocation to industry in the market's third compliance period, 2018-2020. I want to take a step back and reflect on the arguments from industry, which broadly supports the direction the Air Resources Board gave its staff in Resolution 17-21. Julie Cart quotes Catherine Reheis-Boyd, president of the Western States Petroleum Association, who responded to Senator Wieckoswki's remarks by noting that “the way the allowances are distributed has no impact on how the cap-and-trade program ultimately reduces emissions.” In essence, Ms. Reheis-Boyd is saying we shouldn't worry about how much any individual group pays under the program; instead, we should focus on the bottom line for greenhouse gas emissions. Her argument is textbook environmental economics, and it's fair as far as that goes. But it's also an unsatisfying answer for two reasons. First, neither ARB nor WSPA has provided a justification for why WSPA members should receive extra benefits from the public. Free allocation is a transfer to special interest groups from the general public, which pays for the costs of climate policy. Sometimes these transfers are justified in order to protect against the risk of emissions leakage—the undesirable outcome in which some companies are put at a competitive disadvantage compared to their competitors who don't face a carbon price. Other times the transfers are pure politics that have nothing to do with leakage. In this case ARB directed staff to reverse course and increase, rather than reduce, free allocation. Some industries might very well need additional support, but the oil and gas industry gets the lion's share—72% of free allowances offered to industry in 2016, with refiners getting 50% of the total (see ARB data here). So as far as I'm concerned, there is plenty of room to ask how effectively a political solution that primarily benefits the oil and gas industry addresses leakage risks—especially given WSPA's central role in the AB 398 negotiations. Second, if we focus only on greenhouse gas emissions reductions and not whether consumers bear program costs that aren't shared equally with industries, Ms. Reheis-Boyd's argument is still incomplete. As she suggests, the level of free allocation doesn't affect the total number of allowances in circulation; in turn, the total number of allowances is what determines cumulative emissions under the cap-and-trade program. I agree that is important to avoid confusion over these two issues, but Ms. Reheis-Boyd's suggestion that cap-and-trade will deliver emission reductions whether or not any specific industry receives special treatment is unfounded. The program's effects on total emissions will depend on how ARB implements AB 398. Even if one is concerned only with the cap-and-trade program's effect on cumulative greenhouse gas emissions, industry's influence over the free allocation question is relevant because ARB will decide determine the program's stringency. Right now there are too many allowances in circulation, so the cap-and-trade program is weak and producing little if any effect on emissions. ARB adopted placeholder post-2020 regulations in Resolution 17-21 that do not address the market's oversupply problem. Unless ARB acts to tighten the program during the AB 398 implementation process, cap-and-trade will fall well short of California's climate goals. From the beginning of the debate over ARB's Resolution 17-21, I have argued that it is fair to ask about the treatment special interests are receiving. Above and beyond those concerns, it is also extremely relevant to observe the fact of political side deals on free allocation that illustrate the influence powerful industries are exercising over the AB 398 implementation process. That influence is cause for concern with respect to the cap-and-trade program's ultimate stringency. ARB can and should do the right thing in addressing market oversupply, reforming its cap-and-trade regulations to deliver a stringent program that helps the state meet its 2030 climate target. But if ARB stays the course and listens to industry during this implementation process, the program outcome is likely to be weak and the state is likely to miss its 2030 climate target. So whether one cares about the equity impacts of climate policy, the bottom line for emissions, or both, it's time to pay close attention to the Board's actions. However, some analysts are concerned about how the state will meet its ambitious goal for slashing emissions to 40% below 1990 levels by 2030. Even though the cost of permits has been rising, it may not happen fast enough to provide an adequate financial incentive for companies to clean up their operations, said Danny Cullenward, a Stanford University energy economist. State regulators should take steps to ensure they’re auctioning the right number of permits because making too many available could allow too many emissions, he said. "Lurking in the background is a much more serious issue,” he said. With AB 398's passage on 2/3 vote basis, there is no longer any legal uncertainty over the program's future, so it'e heartening to see auction demand pick up. Nevertheless, AB 398 delegates broad discretion to the market regulator, CARB, to determine the program's stringency going forward. CARB faces enormous pressure to keep the market in an oversupplied condition, but could do the right thing and clear up the oversupply problem with the legal authority the legislature provided. Without a clear signal that CARB is going to increase program stringency to deal with the oversupply problem, it's no wonder the new auction results were modest. Auction prices cleared a little more than a dollar over the minimum offer price, which is both the highest price in market history and far short of what California needs to get on track for its SB 32 target. This is exactly what one should expect given that AB 398, the market re-authorization bill, only requires CARB to analyze, not eliminate, oversupply. Absent a strong signal from CARB that it will do the right thing and design a program that binds, we should expect low market prices. So for all the good news, the auction results also indicate that those who want to see this program deliver on the state's ambitious goals have a lot more work to do. I am late in posting this, but CALmatters has a great in-depth story on the side deals emerging in the implementation of California's cap-and-trade program. Last month the California Air Resources Board quietly approved regulations that sent some $300M worth of extra free allowances to the oil refining industry, as I wrote about previously. Over at CALmatters, Julie Cart and Laurel Rosenthall dug into the story and learned some remarkable things about the process that led to this outcome—go read the whole thing. I have a new commentary piece in this week's issue of Nature, jointly written with lead author David Victor (UCSD / Brookings); Keigo Akimoto, Yoichi Kaya, and Mitsutsune Yamaguchi (RITE Japan); and Cameron Hepburn (Oxford). We call on governments that want the Paris agreement to work to revisit their pledges now — well ahead of when the formal review process begins around 2020 — and to be honest about what they can and really will do. They should open up their pledges for voluntary peer review by other nations and by scientists. Only with greater transparency, anchored in reality, can bottom-up climate diplomacy yield true cooperation. Ambition is no substitute for action. Yes, I am on a transparency kick these days. Did the Air Resources Board just approve an illegal regulation while transferring hundreds of millions of dollars to the oil industry? Last week the California Air Resources Board (ARB) held a board meeting to discuss the future of California’s cap-and-trade program. By a voice vote, the Board approved Resolution 17-21, a far-reaching directive that extended California’s cap-and-trade program. It also set up a process for sending hundreds of millions of dollars to the oil industry—above and beyond what policymakers agreed to in AB 398, a bill with major concessions that some environmental groups labeled a “bitter pill” necessary to secure its passage. Given that Governor Brown just signed AB 398 into law to provide ARB with the authority to continue its cap-and-trade program through 2030, one might think that Resolution 17-21 is the next obvious step. But AB 398 doesn’t hand ARB a blank check to do as the board wishes. Rather, AB 398 requires that if ARB adopts a cap-and-trade program that applies after 2020, then that program must reflect the changed market design that the bill’s supporters negotiated over the last few months. The provisions that follow describe the new market design features required by AB 398: reduced carbon offset limits, a hard price ceiling, and so-called price containment points, to name only a few changes the new state law requires in any post-2020 cap-and-trade regulation. ARB’s current market design lacks these features and is inconsistent with the plain text of the new statute, which is why it can’t be adopted without reform to apply to the post-2020 period. I say that the outcome appears to violate the statute because no one actually knows for sure. Neither Resolution 17-21 nor the final regulation it purportedly approved is available online. You can watch video of the board meeting and hear the unanimous voice vote approving Resolution 17-21, but as of this writing, you won’t find the resolution or final regulation on ARB’s website. BE IT FURTHER RESOLVED that the Board adopts the amendments to the California Cap on Greenhouse Gas Emissions and Market-Based Compliance Mechanisms set forth in Attachment A to this Resolution. Yesterday I spoke by phone with ARB’s Clerk of the Board, who helpfully informed me that Resolution 17-21 is still being finalized, presumably as a result of an oral amendment introduced during the board’s deliberations last week. It will be posted online when that process is complete. The entire regulatory package is subject to an August 4 deadline as imposed by the Office of Administrative Law (OAL), so the public will learn soon enough what just happened. When I asked whether ARB would publish the attachments to Resolution 17-21—including the final regulation order that was approved last week—the clerk said that they were already online. However, we confirmed together that in fact these documents were not online. The clerk promised to upload them soon. If the regulation applies in the period 2021-2030, it must comply with the provisions of AB 398. Given that ARB’s proposed post-2020 cap-and-trade regulation did not include the market design changes required by AB 398, any decision to adopt the current market design into the post-2020 period is inconsistent with the legislature’s clear directive in AB 398. Alternatively, perhaps the new regulations apply only to the pre-2020 period, during which time ARB retains discretion in implementing the requirements of AB 32. In that case, however, one might question the adequacy of the public process. The proposed regulation before the board last week would have extended the cap-and-trade program through 2031, so it would have needed to be modified in order to limit its temporal scope; yet if it were modified to avoid inconsistency with AB 398, there was no public notice of that change and no opportunity for public comment, contrary to the basic principles of state administrative law. Until ARB releases text of Resolution 17-21 and the final regulation it approved, however, public stakeholders cannot verify whether or not ARB respected public notice and comment process requirements or the requirements of AB 398. Meanwhile, buried in last week’s deliberations and the text of Resolution 17-21 is another handout to the fossil fuel industry, which successfully negotiated a significant transfer of wealth under AB 398 earlier this summer. Under AB 32, ARB is required to “minimize leakage” of emissions (H&S Code § 38562(b)(8)). In the cap-and-trade program, ARB minimizes leakage from energy-intensive, trade-exposed industries (EITIs) by providing free allocation of allowances to certain industries, which are classified as high, medium, or low leakage risk. Free allocation starts at generous levels in the first (2013-14) and second (2015-17) compliance periods, but under the regulations that applied as of last week, was set to step down in the third compliance period (2018-2020) for medium and low risk industries (see Table 8-1 on page 144 of the current market rules). The complete formulas are somewhat complicated, but all one needs to understand the deal given to industry in AB 398 and Resolution 17-21 is that the level of free allocation is multiplied by a so-called industry assistance factor (IAF). Currently, all industries receive a 100% IAF. Beginning in 2018, however, medium and low risk industries are scheduled instead to receive a 75% IAF—a 25% reduction from current levels. These planned reductions are based on careful studies conducted by ARB and external experts that concluded perpetual free allocation at a 100% IAF was not necessary to protect against leakage. Indeed, ARB had initially considered reducing the IAFs to much lower levels for some industries in the post-2020 period, perhaps as low as 44% for oil refiners (see Table 8-3 on page 169 of the December 2016 NODA). Now don’t get me wrong: leakage is a legitimate risk that requires an effective solution. Many of California’s industries could be put at a disadvantage relative to their competitors who don’t face a carbon price. That could lead to lower economic growth, job loss, and leakage of emissions as California consumers buy more products produced outside the reach of the state carbon pricing policy. But don’t be confused about how free allocation operates in practice. The oil and gas industry received 72% of the free allowances given to EITIs in 2016—about 50% to the midstream refining industry and another 22% to upstream oil and gas producers. That means that only 28% of the free allowances given to industry went to the kinds of firms most people think of when they worry about competitiveness and leakage—manufacturers, dairies, and food processing industries. BE IT FURTHER RESOLVED that the Board directs the Executive Officer to propose subsequent regulatory amendments to provide a quantity of allocation, for the purposes of minimizing emissions leakage, to industrial entities for 2018 through 2020 by using the same assistance factors in place for 2013 through 2017. Let me be crystal clear on this point. ARB is now required under AB 398 to hand out a massive number of free allowances to the oil and gas industry from 2021-2030, a concession that industry extracted from the Brown Administration in exchange for a 2/3 vote on cap-and-trade. That was a political deal—the “bitter pill”—and now it’s the law. But by law ARB is also required to exercise its independent judgment about how many free allowances are needed to protect against leakage risks in the three years leading up to AB 398’s new market era. Instead of exercising that judgment, however, ARB instructed its staff to achieve a pre-determined political outcome that transfers public wealth to special interests. So what’s the cost of ARB’s new handout? Let’s take a look at the refining industry, which received 50% of the free allocations in 2016. The refining industry is classified as a medium risk industry, which means it is scheduled to receive a 75% IAF in 2018-2020, instead of the 100% IAF it receives today. Resolution 17-21 would increase the IAF to 100% in 2018-2020. For simplicity I will assume that refinery production remains constant at 2016 levels over the 2018-2020 period, while accounting for the declining cap adjustment factor, such that I vary only the industry assistance factor to illustrate the differences. Bottom line: Resolution 17-21 would give the refining industry an extra $300 million over three years, resulting in significantly more free allocation than what ARB staff and outside experts concluded was necessary to satisfy the requirements of AB 32 and protect California businesses against leakage. That money that could instead be going to the unfunded AB 617 local air pollution mandates, returned to California taxpayers via climate rebates, or spent on infrastructure that creates public value. Instead, it’s going to the refining industry via a side deal. One has to wonder: when it comes to important decisions at ARB, do special interests call the shots? ARB’s side deal with the oil industry is cause for concern because AB 398 delegates most key market design questions to ARB. This means that whether the program delivers on its environmental goals or not depends on how ARB implements a very flexible statutory framework. Unfortunately, last week's resolution is not a good sign. Perhaps the most important issue in the AB 398 implementation process is ARB’s oversupply problem: there are far too many allowances in circulation, which is why the 2016 auctions crashed and the independent Legislative Analyst’s Office concluded that the program is “likely not having much, if any, effect on overall emissions” so far. Getting rid of market oversupply will be necessary if the program is going to deliver on the state's 2030 climate goals. Instead of requiring ARB to eliminate market oversupply—such that emissions actually fall in line with the state’s climate goals, with the program serving as a “backstop” per the standard line from some national environmental groups—AB 398 merely directs ARB to “[e]valuate and address concerns related to overallocation … as appropriate” (H&S Code § 38562(c)(2)(D)). You can imagine what ARB will determine is “appropriate” if they ask the oil industry for the answer. It certainly won’t be a backstop that delivers on California's climate targets. To my friends who supported AB 398, I have to ask: how big will that bitter pill get before you have trouble swallowing? For all of the talk of how AB 398 offers a framework that can be improved over time—and in theory, it does—this episode is not a great start. We can and we must do better. ARB Resolution 17-21 and the post-2020 cap-and-trade regulations are now online. The post-2020 cap-and-trade regulations do not account for AB 398, as suggested in my original post above, but will instead be modified by a future rulemaking. 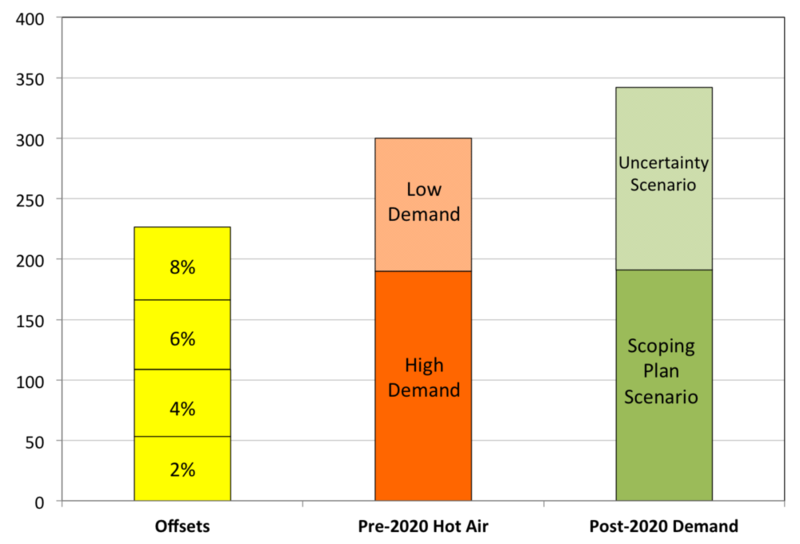 California policymakers need to carefully balance supply and demand in a post-2020 carbon market in order to address cost containment and environmental outcomes at the same time. Two critical issues are (1) what to do with the significant supply of excess allowances in the pre-2020 system and (2) what role carbon offsets should play in the post-2020 program. To explain these concepts and provide quantitative context for their impact on market design, I prepared a short policy brief. Both offsets and excess allowances have the potential to independently overwhelm the supply/demand balance in the post-2020 period and therefore require careful study. Allowing covered entities to use today's oversupplied allowances in tomorrow's program introduces the problem of "hot air": because these excess permits aren't needed with emissions today falling below program caps, their future use increases total emissions. If allowed, these allowances would enable covered entities to comply with the program on paper without actually reducing their emissions—hence the term "hot air." Unfortunately, the estimated size of current market oversupply is comparable to the role ARB projects for the post-2020 cap-and-trade program. Carbon offsets generate credits for emission reductions that take place outside of the cap-and-trade program. At current limits—8% of total emissions—offsets could generate more credits in the post-2020 program than ARB projects the cap-and-trade program will need to deliver. As an aside, ARB assumes perfect foresight in its calculations of the emission reductions required to reach the SB 32 target for 2030 and in the role cap-and-trade will need to play in achieving those reductions. This is not the right way to think about a fundamentally uncertain future; we could need significantly more or less mitigation depending on economic growth, oil prices, technological change, and a host of other factors we can't know in advance. For the purposes of illustrating the importance of hot air and carbon offsets, however, it is reasonable to compare the size of these two issues against ARB's calculations. Thanks to Andre Marcu and his team at ICTSD for inviting me to join a workshop last week with EU policymakers and academics on the role of border adjustments in carbon pricing policies. I learned a lot from my EU colleagues and appreciated the chance to participate remotely. KPCC aired a special program yesterday on the big climate news of the day: what the U.S. withdrawal from Paris means for the planet, the country, and California. KPCC's environment reporter, Emily Guerin, closed the segment with a discussion of how California intends to meet its 2030 climate target and briefly featured me on the way California's vehicle waiver standards operate under a hostile federal administration. For more on how California's vehicle waiver works and why it matters, check out this article from MIT Technology Review. Yesterday evening I joined Sally Benson, Jeff Ball, and student moderator Madhur Baloor for a Stanford Energy Club E360 panel titled Envisioning the 2050 Energy Landscape. Thanks to my fellow panelists, Madhur, and the SEC student organizers for their hard work. I was especially happy to see some BERC students make the trip to Stanford from UC Berkeley—we need more cross-campus engagement in the energy community! The event was recorded and I'll post video as soon as it is available. Over the weekend I appeared on CNBC Asia's Squawk Box with Bernie Lo to talk about U.S. energy policy and President Trump's executive orders on the environment. A clip from the segment is available here. As the California climate policy conversation begins to focus on the design of a post-2020 carbon market, one of the issues that has drawn the most criticism—and frankly, the most inaccurate criticism—is how SB 775 contemplates California's approach to linking its carbon market with similar programs in other jurisdictions. Linking. Some have suggested that SB 775’s new requirements for linking are unduly burdensome and would frustrate future market links. Banking. Some have argued that SB 775’s limited banking provisions render its market design incompatible with other jurisdictions’ choices. Offsets. Because SB 775 prohibits carbon offsets in the post-2020 market, others have suggested this makes it impossible to link with other jurisdictions that don’t ban offsets. Each of these concerns is misplaced, as I’ll explain below. I agree with constructive critics that the conversation around banking merits additional discussion; even though I don’t believe the current proposal would complicate future market links, any independent movement on the banking conversation will make linking even easier than what is presently contained in SB 775. Contrary to critics’ claims, SB 775 proposes a market that is just as open to new market links as the current program. California’s carbon market is currently linked to a similar but smaller market in Québec, and Governor Brown recently made the necessary findings to begin a market link with another program in Ontario. Notably, however, neither of these jurisdictions has a post-2020 carbon market at this time—and nor does California. SB 775 would create a new trading program in the post-2020 period that does not begin as linked to any external market. This is a sensible starting position because nobody actually has a post-2020 market to link to at this time. Nevertheless, SB 775 remains open to future market links. The proposal would require new conditions on links to protect the political sustainability of the new market design, building on existing rules governing market links. Current state law requires the Governor to make four affirmative findings before the Air Resources Board is allowed to finalize regulations to link its carbon market to an external program. These requirements were established by SB 1018 in 2012 and are codified in California Government Code § 12894. First, that the prospective linked market has minimum carbon prices that are equal to or greater than those in the California market. Second, that the prospective market link wouldn’t threaten the performance or purpose of the climate dividend established by SB 775. These new conditions clarify the general requirement under SB 1018 that the prospective linked program have program requirements that are “equivalent to or stricter than” California’s system (Cal. Gov. Code § 12894(f)(1)). In essence, the new requirements merely ask the Governor to confirm that the revenue recycling provisions in SB 775 aren’t disrupted because the Air Resources Board decides to link with an external jurisdiction with much lower market prices. In that instance, significant revenue could flow from regulated companies in California to out-of-state actors, rather than back to California residents via the dividend. If Québec, Ontario, or other jurisdictions adopt comparable minimum carbon pricing trajectories, SB 775 would enable the Air Resources Board to link its post-2020 market to these external programs. Again, however, none of these governments has established a post-2020 market. If California policymakers have signaled to the state’s partners that the current market design will continue without modification, they have erred: AB 32 clearly does not provide the authority to continue the program without legislative re-authorization. Thus, the question of whether or not there will be a carbon market in California depends on the legislature providing the Air Resources Board with that authority. There will be no links without a new bill. As the first comprehensive proposal designed to deal with practical political constraints in the legislature, SB 775 provides a clear path for future market links, including continued market links with our current linked partner, Québec, and with our proposed linking partner, Ontario. SB 775's new linking requirements are clarifications of the existing rules as those rules would apply in the context of the post-2020 market design. In other words, SB 775 is a step forward for those who want to see continued market links, not the end of the line. SB 775 has limited banking provisions in the post-2020 period, requiring regulated entities to demonstrate compliance every year and limiting the compliance validity of allowances to the year in which they are sold at auction. This limited banking is a departure from the current market, which features unlimited banking. Although no one has specified exactly how these changes would pose a problem to market links, some respected voices—like Resources for the Future's Dr. Dallas Burtraw—have criticized SB 775’s banking provisions as posing a potential barrier to future market links. Personally, I am not convinced that limited banking provisions are a barrier because there is no reason a program along the lines of SB 775 couldn’t be linked with an external market that features unlimited banking. But in any case, the reason for limited banking in SB 775 is to address a key challenge that follows from the inclusion of a rapidly rising price ceiling, and that problem needs to be managed independent from the linking process. With a hard price ceiling, the regulator is obliged to issue unlimited permits at a specified carbon price—in this case, the world’s most ambitious carbon trajectory, not some modest safety valve that excuses industry from the program. A price ceiling is necessary to contain costs and provide certainty that the Governor won’t face political pressure to suspend the program, as is his or her right under current law (Cal. Health & Safety Code § 38599). But it also poses a problem: if companies can buy unlimited allowances at a price ceiling that rises rapidly every year, they will have an incentive to buy extra allowances in the early years (at low prices) and bank these allowances for use in later years (at high prices). In this case, companies could effectively avoid the rising carbon price and therefore frustrate the core purpose of the program—producing a credible incentive to reduce climate pollution. To date, there has been precious little discussion of how to manage the negative consequences of unlimited banking under a rising price ceiling. After the release of SB 775, however, some thoughtful economists have begun to share ideas on how this problem could be overcome—including Dr. Burtraw. I am optimistic that this technical conversation will bear fruit and could potentially allow the legislature accomplish its goals under a less restrictive banking rule. Again, the SB 775 market design not require other markets to copy its banking rules as a precondition of linking. It is entirely possible to link a program with limited banking to a program that has unlimited banking, so critics' concerns are misplaced. As a result, SB 775 has no impact on the choices other jurisdictions make with respect to their domestic market rules on banking. And even if I am wrong, there remains room to solve the underlying problem of how to control the negative consequences of banking under a rising price ceiling. If that conversation proceeds, it could have the effect of removing any hypothetical barrier to future market links. Finally, I want to address a common misconception about SB 775’s prohibition on the use of controversial carbon offsets in the post-2020 period. Some have suggested that this prohibition would block California’s ability to link with markets that retain some use of carbon offsets. But this is neither the purpose of SB 775 nor the actual requirement of the proposal. It could be argued that because SB 775 bans offsets, the Governor would be unable to make this finding where a proposed linking partner allows for carbon offsets. In this case, one might argue that the proposed linking partner does not have offset requirements that are "equivalent to or stricter than" California's. In legal terms, however, this argument is wrong for two reasons. First, the more appropriate reading of the current linking standards is to compare the provisions governing the standards that would apply to carbon offsets under state law. In his findings approving market links with Québec and Ontario, Governor Brown compared these program’s offsets standards to California’s own requirements that market-based measures like carbon offsets produce emission reductions that are “real, permanent, quantifiable, verifiable, and enforceable” (Cal. Health & Safety Code § 38562(d)(1)) (see findings here and here). Under SB 775, a future Governor could approve market links to programs that include carbon offsets using a similar comparison. Current law requires our partners to maintain minimum carbon offset standards, and that is good policy. Any post-2020 carbon market should maintain this standard even if it precludes the use of these instruments for compliance in California. After all, the environmental integrity of each linked market affects that of all others, so minimum standards will always be required to continue market links. Second, it is important to recognize that the SB 1018 linkage findings are not judicially reviewable (Cal. Gov. Code § 12894(g)). In other words, the only recourse for someone who disputes the Governor’s findings is through the political process, not the courts. A court cannot and will not review the Governor’s standards, which gives the Governor significant leeway in interpreting the linking requirements. As a result, SB 775 should not be read to preclude market links with jurisdictions that retain the use of responsible carbon offsets. In my view the bill would benefit from an amendment to clarify this outcome, but in any case, nothing about current state law or its proposed modification under SB 775 would prohibit market links with jurisdictions that retain the well regulated use of carbon offsets. Contrary to some concerns, SB 775 does not frustrate the prospect of future carbon market links. In fact, it is a step forward because future links are possible if and only if the legislature re-authorizes cap-and-trade with a 2/3 vote. Under SB 775, jurisdictions that match California’s climate ambitions are welcome to join the new trading period. The state’s partners would remain free to choose their own market designs as they see fit—including on banking and carbon offsets. Governor Brown has already concluded that the market designs in Québec and Ontario are consistent with California standards in terms of their minimum treatment of offsets; he or his successor would presumably do so again. Danny Cullenward, an energy economist at Stanford University, said the proposed budget is an attack on the integrity of both U.S. environmental protection and the nation’s leadership in energy innovation. To date, the social cost of carbon hasn’t generally been the make or break factor on any given public policy cost-benefit analysis, says Danny Cullenward, a Stanford lecturer and energy economist. Rather it provided an additional economic and climate justification for policies. In the same way, it’s not likely to be the single underpinning that, once watered down or removed, suddenly allows the Trump administration to enact the sweeping changes to environmental rules that they aspire to make anyway. The bigger play here is to dull or destroy an instrument that could become much sharper in the future, as the mounting body of science provides a clearer sense of the true, higher cost of greenhouse gas emissions. “It was much more a tool intended to be proactive on climate policy, rather than as a defensive line to hold ground,” Cullenward says. Thanks to James for taking the time to dig into this complicated but important issue. I've been thinking a lot about the future of the social cost of carbon in preparation for an upcoming session in my class this quarter, and will also be participating in a SIEPR workshop where environmental economists will discuss the next generation of econometric studies of climate damages. This new article is a great overview of the key issues to watch for in the coming weeks and months, as well as a useful reminder of how scientific and policy issues blend together during times of political change. There could be other ways forward, of varying degrees of attractiveness to lawmakers. The program could get around the precepts of Proposition 26 by giving all of the carbon allowances away for free instead of selling them, but that would deprive the state and residents of auction proceeds. ARB could also use an "enforcement fee," which would look like a carbon tax and could be pegged at whatever level the state decides would cover the "reasonable costs" of mitigating greenhouse gas emissions. "Short of a two-thirds supermajority vote, I don't see any other legally viable path forward with a market structure," said Danny Cullenward, a research associate at Stanford University's Carnegie Institution for Science who advised state Sen. Bob Wieckowski (D) and state Senate President Pro Tempore Kevin de León (D) on S.B. 775. While observers agree that lawmakers have power over the program, there are differing views on the expectations market participants should have of them. "All of these players understand there is no market for their product without legislative reauthorization, and any of them that invested beyond the 2020 time frame took on that risk knowingly," Cullenward said of the dismayed offset developers. Update. My friends at UCLA's Emmett Institute continue to make statements that suggest ARB might have the necessary authority to extend cap-and-trade without a new 2/3 vote. For example, the ClimateWire story quotes Cara Horowitz as saying "In my view, it would be risky — but not totally unfounded — to [extend cap-and-trade on the basis of existing law]." It is worth emphasizing that nobody has publicly offered a legal theory as to how this would be permissible. In contrast, I have repeatedly analyzed this question, including in a 25,000 word law review article that was peer reviewed by some of the top lawyers working on California climate policy, an extensive comment letter to ARB with Michael Wara, and in testimony to the Senate Environmental Quality Committee. My conclusion is that there are no defensible options to proceed with the current market design without a 2/3 vote to re-authorize ARB. So I ask again: what is the theory that ARB can continue cap-and-trade beyond 2020? For readers who are not steeped in the weeds of administrative law, it is a remarkable thing when an agency proposes a major rulemaking but does not articulate the statutory basis for its authority. Yet that is what ARB has done in its proposal to extend cap-and-trade through 2031. EPA's Clean Power Plan offers a useful counterpoint. The CPP was controversial and many states and industry opponents doubted EPA's authority to regulate greenhouse gases under Section 111(d) of the Clean Air Act, leading to the West Virginia v. EPA litigation in the D.C. Circuit. In its proposed and final regulations, however, EPA offered a lengthy discussion of its legal authority and even put out a 100-page legal analysis of the critical and contested issues. EPA's actions were the sign of an agency that has a strong case to make and is willing to test its convictions in court. It is also no less than what the public should demand with respect to major rulemakings: if the agency's authority is so unclear that no one will articulate the legal basis for its actions—not the agency, and not even any supporters in academic or non-profit groups—then we should all take notice of the situation. As someone who supports carbon pricing, I do not see any reasonable choice other than to secure re-authorization with a 2/3 legislative vote. With respect to my friends who prefer the current market model and aren't interested in discussing modifications, I urge them to reflect on the strong likelihood that the alternative to the legislative process is the expiration of the current cap-and-trade program. We should all agree that is the worst outcome.